National Pet Fire Safety Day. Man, that’s super specific. Not just Pet Safety, but Pet FIRE Safety. Do we even need a day like this, you ask? Well, apparently it’s a much bigger deal than I thought. 1,000 pets start a house fire each year. Those numbers break my heart. The AKC and ADT first recognized July 15 as National Pet Fire Safety Day in 2008, knowing July is typically one of the driest, hottest months of the year. It’s the month known for lots of outdoor fires and fireworks. I, personally, love the idea and love them for doing it. 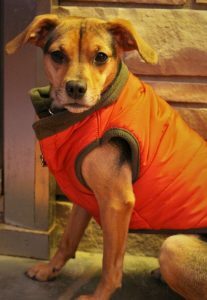 I’m a dog-obsessed puppy mommy, and our little girl (a 4-year old rescue named Pixie) is the light of our life. Extinguish open flames- This goes for every person in every house with or without a pet. While it may be silly and obvious, please go around the house and check to make sure all the candles are out before you leave. You would be shocked- SHOCKED- at the number of claims we’ve filed for clients who left a candle burning. One client lost their entire house a week before Christmas due to a lit candle. My own… err… relative left a candle burning in our house one time. It landed in the pool of its own wax that had melted into the carpet when it fell. No major damage was done, they just had to replace a section of the rug. That could easily have burned down the house. And before I forget, fireplaces count too! It’s so easy to take a quick look and assume all the embers have been doused. Just give the fireplace a quick poke to make sure. Invest in flameless candles- What’s WAY easier than dealing with flames? NOT dealing with flames! Just buy the new fake candles and ~viola~ no fire! Cats are known to knock over candles with their tails. A flameless candle won’t do any harm. Cover stove knobs- Either remove your stove knobs every time you leave the house (yeah, cuz we all have time to do that!) or just buy plastic covers for them. We’ve all accidentally turned on the range by leaning on it just right. Counter surfing pets can easily do the same with their paws. Just google “pets turn on stove” and watch all the videos. In fact, here’s one where a pup just wanted pizza. Discourage Counter Surfing- I’ll be the first to admit, my dog is a counter surfer. We find the paw prints as evidence. We’ve spent several nights at the puppy ER after twice after she got into various baked treats containing chocolate (thank you, Pet Insurance!) A fellow pet parent and Cedar team member introduced us to ScatMats. They are a safe, static electric way to train your pet to keep off a table, counter, rug, whatever. No glass bowls- We’ve all seen the movie (or the neighbor in real life): kid takes a magnifying glass, gets to the right angle, and goes after an ant or a toy. Or better yet, Woody uses Buzz Lightyear’s plastic helmet to light the fuse. Well, glass bowls left on a wooden deck can do the same thing. The sun started 125 fires in London over a 5 year period- during summer AND winter. It doesn’t have to be super hot out for this one, just the right item at the right angle. So use ceramic or plastic for outside! Pen them in (or out)- Use crates or baby gates to keep Fido and Fluffy in or out of certain areas. My dog jumps 4 feet in the air. Something about a small baby gate (that she can easily jump over) keeps her confined. It’s like she has no clue she can get right over it. Upgrade your smoke detectors- Traditional smoke detectors do an amazing job of sounding the alarm when there’s smoke. It’s quite possible that no one will hear that if you’re not home. How close are your neighbors? I actually tested it once and I couldn’t hear the detector going off when I was standing in my driveway. That’s a good 500 feet from the end of our property. No one would hear that. Advances in technology have drastically reduced prices, making the purchase of a Nest Protect Alarm very affordable. Maybe you’d rather subscribe to Protect America for a very low monthly cost. Oh, and your homeowners insurance company will love you & might give you a discount! Doggy ID- It may sound simple, but make sure your information on your pup’s ID tags and microchip are up to date. God forbid they DO get rescued and go running off while you’re dealing with fire trucks, police, ambulances, helpful neighbors, etc. It’s a crazy scene and Pickles running off can easily be overlooked while your life is going up in flames. It takes seconds to make sure their tags and chip have accurate contact info. 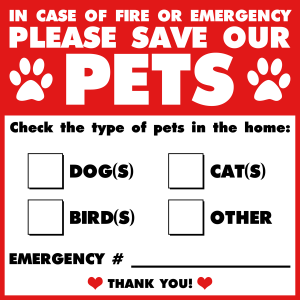 Pet Fire Sticker- We have a little sticker on every outside door to our home that says “In case of fire, please save our pet(s)!” It then lists out how many dogs/cats/birds/other we have. In our case, each has 1 dog and we wrote “Pixie” right on there so they’d know what to call her. We actually have a nice stack of these stickers in our office, so email us now and we’ll mail one out to you. Or stop by our office and ask for one. We’re so much fun! And there’s always food!!) You might even get a dog toy out of it. If you’re anything like me, your pet means the world to you. Take a few minutes this National Pet Fire Safety Day and make sure you have a plan to protect Mr. Bane and Mrs. Fluffers when you’re not home. Oh, and let us know if you’re at all interested in Pet Insurance for them!